Theft of motorhomes, attempted thefts, theft of items from a motorhome and vandalism claims make up almost 20% of all motorhome insurance claims. The majority of these occur when the motorhome is in storage. Therefore, it’s certainly worth spending a bit of time considering the security employed when it’s parked in its storage location. For most motorhome owners, that is the home driveway. The following guide has been produced to help you make your motorhome as secure as possible when it’s sat unused on your home driveway. 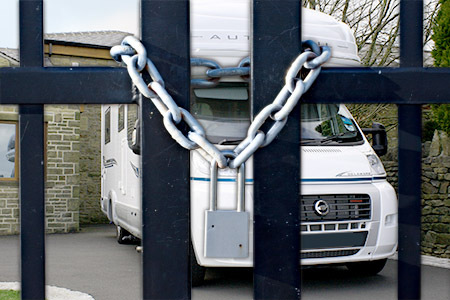 Having lockable gates at the end of your driveway is probably the easiest way to protect your motorhome when it is stored at home – adding a durable chain and padlock to previously unlocked gates can make a big difference. Locked gates are a clear deterrent to thieves, they make thefts significantly harder and often just the noise they make when opening can make it easier to detect a thief on the approach. Drive posts, parking posts, security posts (whatever you prefer to call them) could be a cheaper option than installing new gates at the end of your driveway. Such posts are one of the most popular home storage security methods used by motorhome owners. 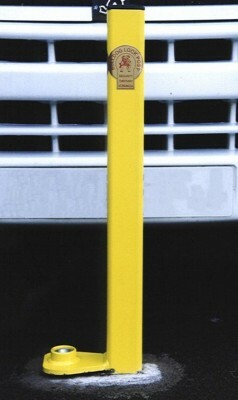 If positioned correctly, to make sure that your motorhome cannot squeeze down either side of the post, they make it difficult for trespassers to take the vehicle off the drive, and of course, they act as a great visible deterrent. Posts don’t have to cost the earth either, prices start from around £50, although there is a bit of work involved to install them, especially the telescopic type that drop into the ground when a hole will need to be dug to accommodate the post when retracted. The fold-down type can be slightly easier to fit but the base will still securing with large bolts drilled into the ground. Of course, it’s worth going for a well made one, Bulldog being one of the most popular manufacturers of drive posts in the motorhome market. Caravan Guard customers with locked gates or drive posts fitted benefit from a storage security discount and therefore save money on their insurance premium – see the motorhome discounts page for details. Remember for insurance purposes, however, that if you have declared your motorhome storage location to have a drivepost or locked gates, it must be kept locked at all times whenever your motorhome is unattended. If you would prefer to catch thieves red-handed and stop a potential break-in as it happens, it could be worthwhile fitting an audible alarm. An alarm could give you or your neighbours an early alert that thieves have struck and it may just scare them away before they take off with valuable contents or driveaway the motorhome itself. Most alarms may give you the audible warning you desire however, if your motorhome is fitted with a Thatcham Category (CAT) 1 approved security system (alarm and an engine immobiliser) you could get a lower insurance price too, for example, Caravan Guard give a 19% discount for such devices. For the full list of security device types Caravan Guard recommend and insurance discounts available, check out the motorhome security page. One of the most sophisticated ways of ensuring your motorhome’s safety is to fit a proactive tracking device. A proactive tracking device linked to a motion sensor or alarm can alert a your chosen tracker’s monitoring station which will in turn quickly make you aware that your motorhome has been broken into or moved – catching the thieves in the act! And if thieves do manage to getaway, such devices give you a great chance of a quick recovery of your motorhome and valuables inside. Plus with Caravan Guard, having one of one of several approved trackers fitted means you can enjoy a 25% insurance discount – see our motorhome tracker page for the types of devices you could fit. It’s probably unlikely many of you will have a locked building or garage at home big enough to accommodate your motorhome and that would allow it to be kept secure and undercover but if you do it’s certainly worth using it. Again an insurance discount could apply for this storage option. Protecting your motorhome in storage doesn’t have to stop at locked gates, driveposts, alarms or trackers, especially as there’s such great range security products available that can deter a thief from even attempting to steal it. 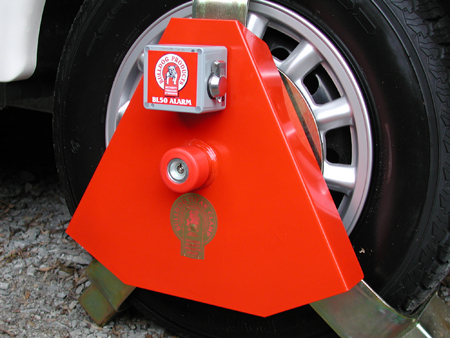 Wheel clamps for one do a fantastic job at immobilising your vehicle. Generally speaking, you should look to spend upwards of £100 for a good model. Look for wheel clamps with Sold Secure approval, which confirms it has undergone testing to show it can withstand known theft techniques for a prolonged period. Steering wheel locks are another popular security device for motorhome owners. Typically these locks come in two forms: bar-lock or circular lock. The main benefit of steering wheel locks is that they act as a great visual deterrent when thieves look into your cab. Installing a movement sensor PIR security light where the motorhome is parked or fitting a domestic CCTV system pointing onto the motorhome are also great ways to expose thieves as they come on to your property! Theft of items from motorhomes whilst in storage remains commonplace. Whilst we can’t speak for other providers, our latest motorhome insurance policy does cover personal possessions such as clothing and non-fixed equipment such as awnings, TVs and generators that could attract thieves if left on display during storage. We cover such items left in the motorhome up to the value of £5000 but nevertheless, it’s recommendable to always remove personal possessions of any value from view in order to give the impression that the motorhome has been completely emptied. 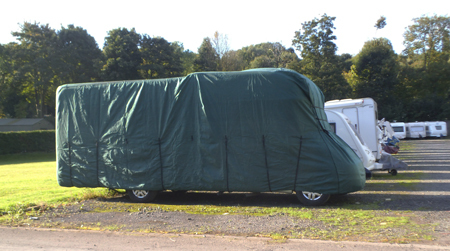 It’s not just thieves that threaten your motorhome whilst in storage, the weather can do it major harm too. Claims for storm damage are one of our top 5 most common motorhome insurance claims and many occur whilst the motorhome is being stored. 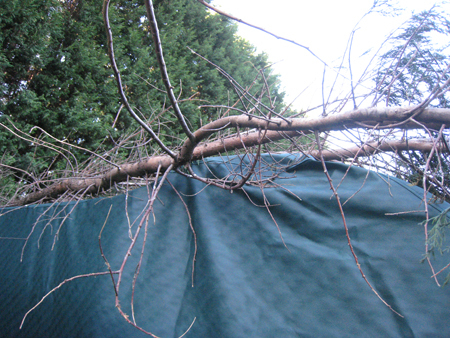 Look around your storage location for overhanging branches of trees, wheelie bins, loose rubble and unhinged brickwork that may blow onto your motorhome during strong winds and consider taking proactive measures. In most cases, home storage locations are plenty secure enough, but if you’re particularly worried about the safety of your motorhome whilst at home, you could always consider moving your motorhome to a secure storage facility. Remember that it costs to use a motorhome storage facility and in doing so you may also affect your insurance premium – you will certainly need to inform your insurance provider when changing storage location. The postcode of your storage location is a major ‘rating factor’, and different postcodes will have a higher or lower insurance rating. Rating by storage postcode is standard practice for motor vehicle insurers. City Centre postcodes will generally be classed as a higher insurance risk than more rural postcode areas, but also certain towns and cities may rate higher than others due to the volume and type of claims experienced there by that insurer in the past. If storing your motorhome away from home, it’s worth choosing a storage facility that offers good security; look for a site which has security measures such as perimeter fencing, 24 hour access control and CCTV in place. The CaSSOA ‘Gold’ or ‘Silver’ awarded storage sites will generally have most of these measures in place. There are some good motorhome storage sites which aren’t CaSSOA approved, but providing they have the aforementioned security measures in place, they can still be considered secure. Our motorhome insurance storage discount applies for using a secure storage facility but the site you choose will need to have at least perimeter fencing and 24 hour access control. Has your motorhome been targeted by thieves whilst stored at home? Do you have any motorhome storage security tips? Please feel free to share your stories and tips using the comments box below. An inexpensive security mod that I have on my van is having the reg. number on the roof. I had a local sign maker knock it up (about £15). My theory is that if it was ever stolen it would make it easier to trace (already have tracker etc.) as I often see police cars on motorway bridges. a secure storage site with perimeter fences, electronic gates, camera,s etc. They hit me with a further bill of approx £100. I complained and it was reduced to £70 if i remember correctly. The area was very quite and when i checked on internet it was deemed to be extremely low crime area. Another Insurance rip of me thinks. The only place I have ever had a vehicle broken into was on a”Gold Plated” patrolled, camera watched, high security storage site! this is in 50 years of driving, caravan bing and motorhoming. Hi, surely as an insurance company, the first thing you want is to minimise the number of claims, currently 20% are from home storage! the most effective would be to put vehicle in secure storage, so why say “EXTREME CASES ONLY” in my opinion it should be the 1st piece of advice given, and as an incentive reduce the premium for doing so! Not rocket science is it! We didn’t want to say motorhome owners should move their motorhomes into a storage site because our theft stats don’t currently point to motorhomes being less likely to be stolen or broken into when in a storage site than when on the home driveway. Note the 20% of claims statistic includes thefts from storage sites too. It probably depends on individual circumstances. If an owner does store at home but there has been a spate of thefts in the area, that’s when we’d recommend the owner consider moving the motorhome to a secure storage site. If you have a removable steering wheel, for seat rotation etc, take it out of the vehicle and store it indoors. Its almost impossible to drive a vehicle without special equipment, if it has no steering wheel. Why nothing about CCTV ? I have 2 cameras aimed at the motorhome and a digital recording of movements…..to help put thieves away and signs to deter. Nigel, there is a little line about CCTV in there (albeit near the end of the article). Sounds like you have a great setup with 2 CCTV cameras pointing on your motorhome. A great deterrent to would be thieves. The Fiamma awning was removed from the side of our motorhome. When we replaced it, we drilled out the screw heads and also put rivets in. If they tried it again, they would have to make a lot of noise to drill them out. We also no park it so that the awning faces the house. I have recently told you about the change in storage of our motorhome. At home it was on the drive without posts, locked gates etc. We have now moved it to a secure premises with perimeter fences, 2 sets of locked gates Monday – Friday, then industrial estate barrier at weekends, several CCTV cameras around the site plus one on the gates, we have to contact the owner when we want to remove the motorhome so that it can be watched on the TV And YOU HAVE CHARGED US £80 MORE!!! IS THIS CORRECT? Look forward to hearing your comments! I can query that for you. Email me your policynumber to craig.thompson@caravanguard.co.uk. As mentioned at the end of the article, the postcode of a storage location has a big effect on an insurance premium. It could be that the postcode of your new storage site is viewed as a much higher risk than your home postcode meaning the premium loading applied for postcode negates the discounts applied for the security at the new storage site.